Floatplane flightseeing is a popular tourist activity in Tofino on the west coast of Vancouver Island. Floatplanes are also used to bring people and food into remote fishing lodges. Float planes in Tofino Harbour, Tofino, Vancouver Island, British Columbiaa, Canada, North America. 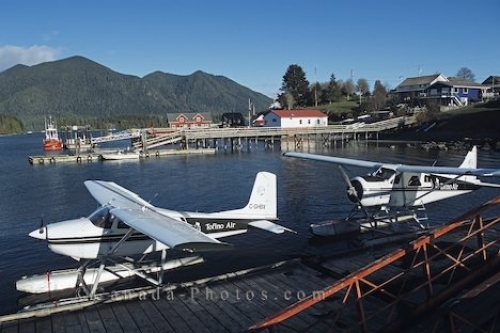 Photo of two floatplanes in Tofino harbor on the west coast of Vancouver Island in British Columbia, Canada.